HF Vertical and Beam Antennas, antennas accessories by Butternut. 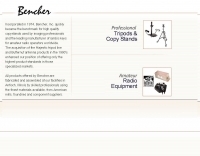 Bencher is out ouf ham radio business. Recently company products has been sold to Vibroplex and DX Engenieering.